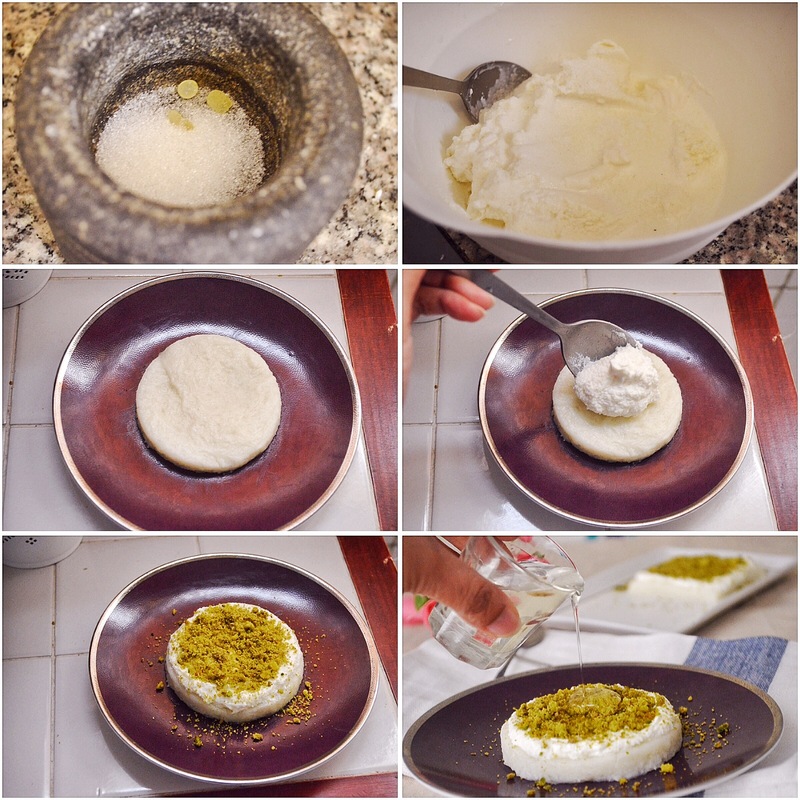 Halawet el riz, is an Authentic Arabic sweet which is a rice, cheese and cream dish. Riz in Arabic means rice. 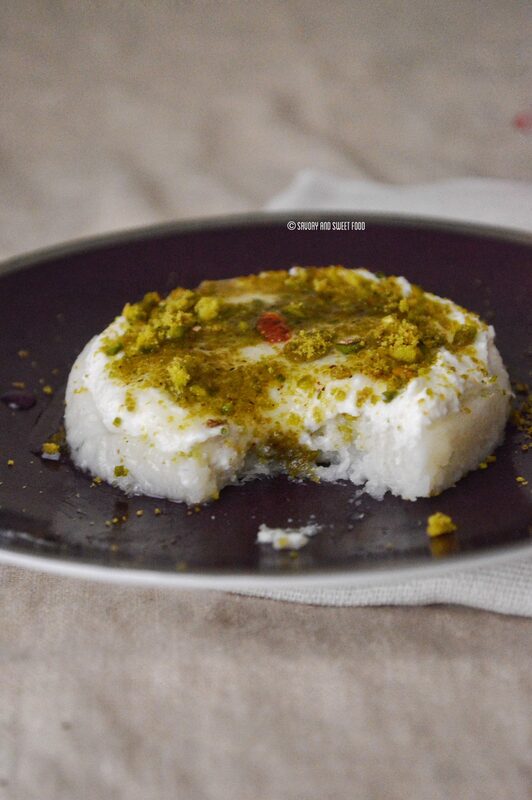 This dessert is a close cousin to Halawet el jibn in taste and flavor. This dish has two layers to it. The bottom layer is made of rice and mozzarella cheese. 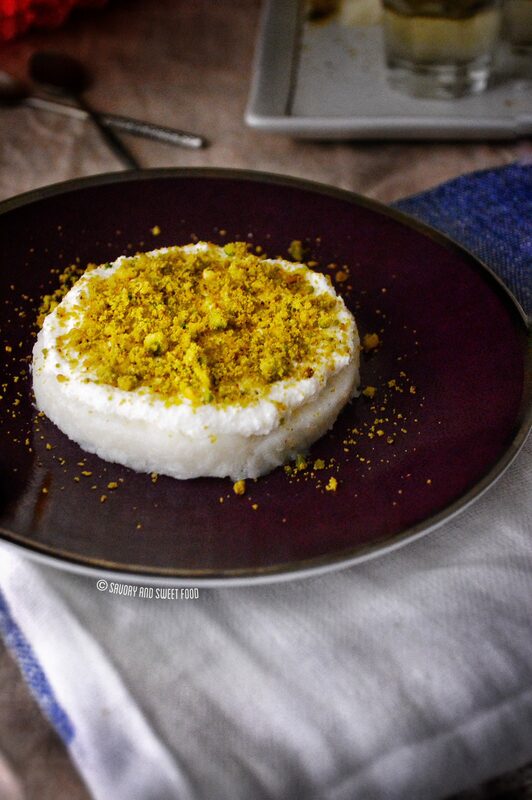 The second layer or top layer is rich and creamy with a bed of ground pistachios on top. Just before serving, pour in a generous amount of fragrant sugar syrup. When you take a bite, there will be explosion of flavors, the pistachios add the crunch and the sugar syrup ties everything together. This sweet is a little bland on its own, but the pleasantly odored sugar syrup turns it into a flavor bomb and takes it to another level. I loved this sweet, you all should try out this very different and exquisite dessert and i am sure you will be just as smitten as i am. 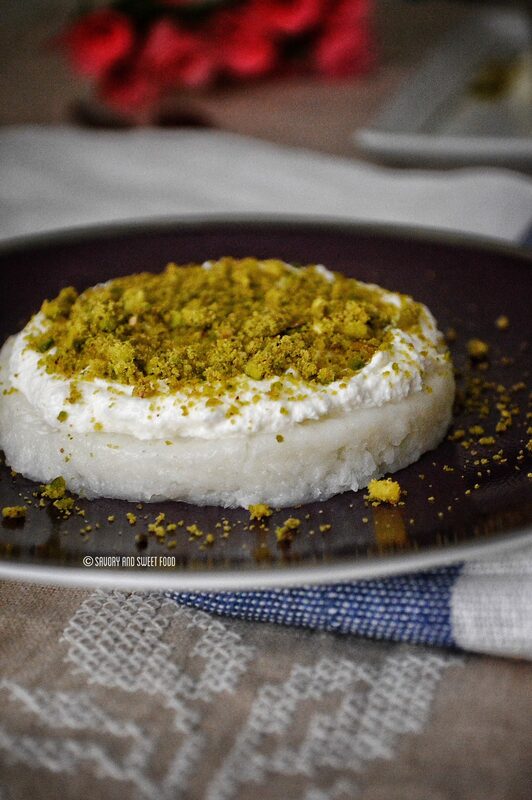 An Authentic Arabic sweet made with rice, cheese and cream and drizzled with a fragrant sugar syrup before serving. In a pan mix together rice and water. Cook till rice is well done. 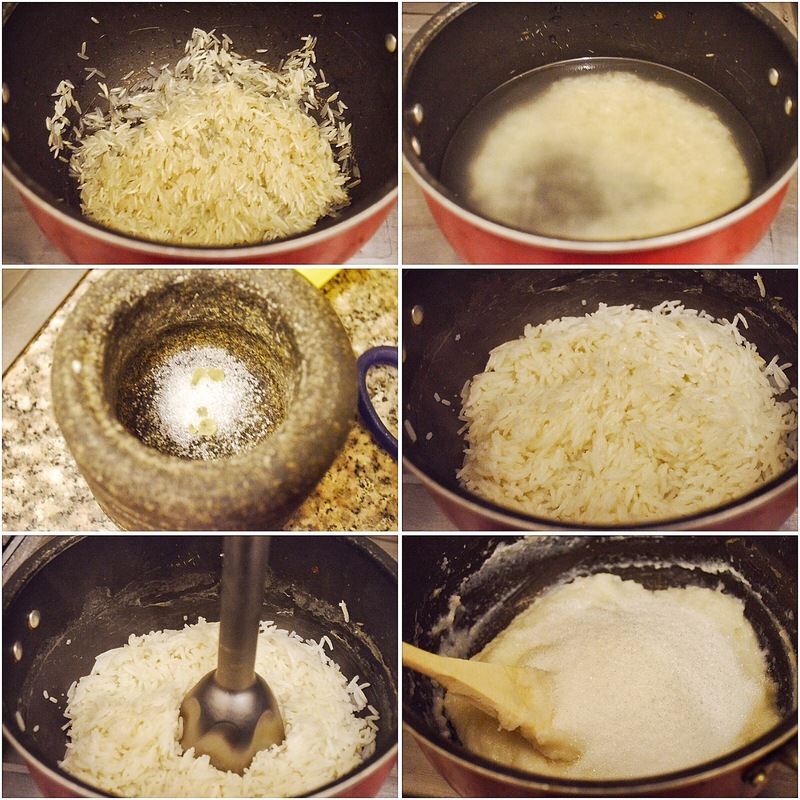 In a mortar and pestle, grind together 1 tsp sugar and mastic till powdered. Blend the rice into a puree. Return back to flame, add sugar and mix well. The mixture will become loose when you add sugar. Pour rose water, orange blossom water and powdered mastic. Add in the mozzarella cheese. Mix on very low flame till cheese is nicely melted. It will be a little tough to stir. Spread this mixture on a tray. Refrigerate it. Mix all the ingredients listed under kashta. Switch off flame and add in orange blossom and rose water. 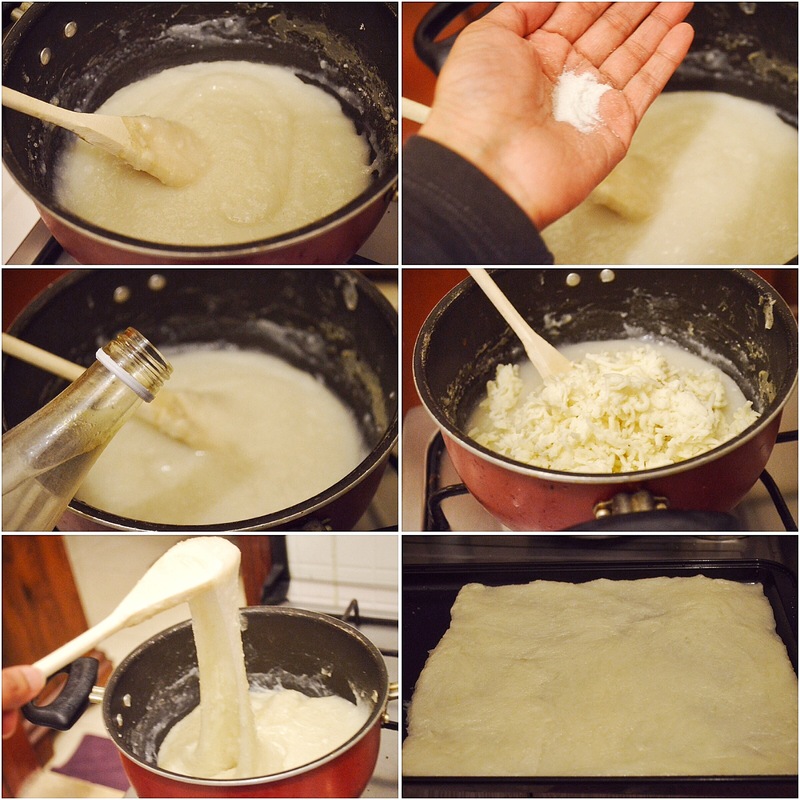 Cut the prepared rice and mozzarella mix into any shape you like. Place the piece on serving plate. Spread a generous amount of kashta on top. Pour sugar syrup and serve immediately. 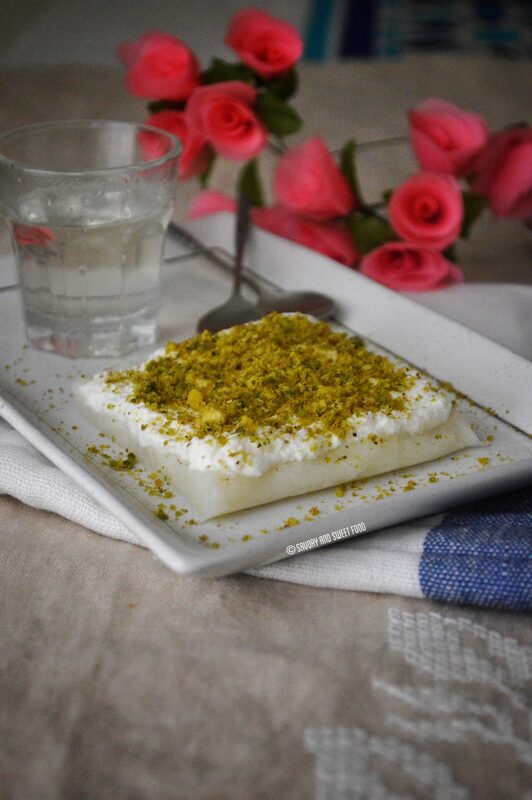 * Plain thick cream with rosewater and orangeblossom water can be used for kashta instead pf ricotta. 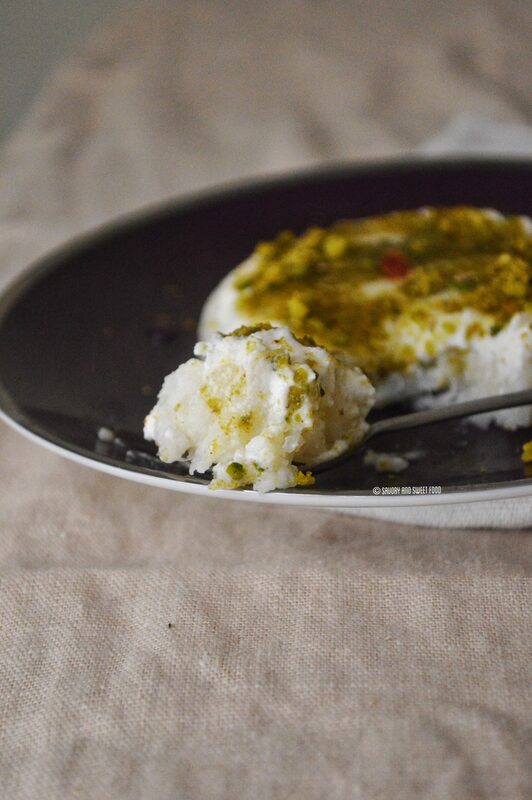 If you get the Arabic cream kashta (clotted cream) that would be best. * Orange blossom water can be omitted if you don't get it. But it sure gives an authentic aroma. * Mastic can be omitted if you don't like the smell of it. Thats Rafeeda! 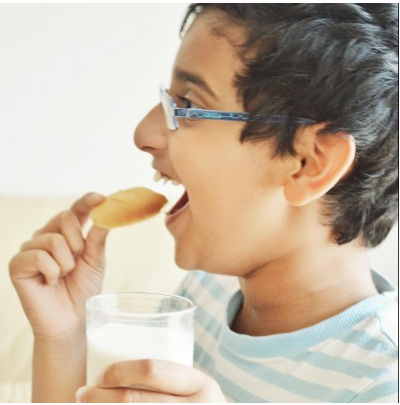 Mastic is available easily everywhere. I got mine from lulu, spice section. Thank you for this great recipe. Can we prepare it a day before and keep it in the fridge for the next day. Yes Nada you can do that. But warm the base a bit before serving or else it will be tough.